The latest show at Grapefruits Post Analog featuring the work of Paloma Kop and Sara Goodman. Grapefruits is a space specializing in non digital programming so I've been looking forward to this as a signature kind of exhibition for the space. I also like the fact that much new media is already old media. Here is a curatorial statement from Sarah: "Within the last 20 years, we've seen the transition from analog to digital video tools in the creation and distribution of moving images. Between maker and consumer, thereâ€™s always been a collaboration between user and tools, but now we rely less on physical labor and more on access to digital software and platforms. Although there is a long history of analog video creation, within recent years, there's been an increased resurgence of analog tools to create and distribute newly created video content. A renewed fascination with physical labor. We take a larger role in the collaboration with the machine from the start. We fetishize the passage of time; the destruction of magnetic medium. We aestheticize the failure and decomposition of a tool that always had planned obsolescence. Nostalgia for a past that had an optimistic future. Now, we master the imperfection and glorify it. Intentionality of destruction; yet generative in its genesis. 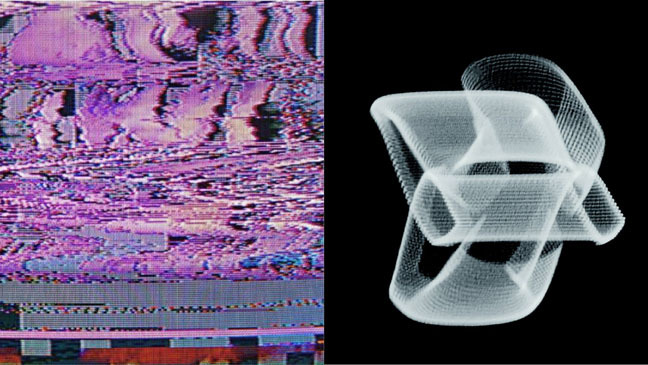 Paloma Kop and Sara Goodman produce video works of generative materials that they then manipulate through physical analog video processing tools. These time based recordings are both performative and ephemeral. A ghost on the screen, tracking, glitching, transforming. Both Sara and Paloma transcend this art form by creating prints of their works. Using a screenshot to hold onto the chaos. Printing out a screenshot, instead of sharing it online. The progression of glitch from electronics to paper, manifests our ubiquitous perception of technology ruling our world. The tools we use, either analog or digital, manifest metaphysical changes to the way we perceive the world." Ok, that is a tall order but that only gets my attention more.... nothing liker a little ambition to make Portland work better as an art scene. Besides I like analog glitchcraft, it speaks to that road warrior aesthetic or the lived in star wars univers where Han Solo had to smack the hyperdrive to avoid obliteration by an Imperial Cruiser.